Eli Tomac started the sprint to the championship with a big win at the Daytona Supercross at Daytona International Speedway, March 9. 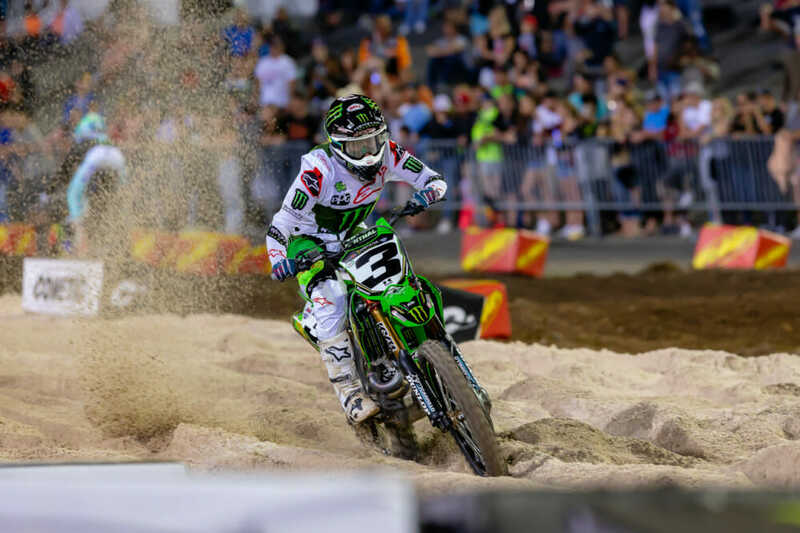 Now two races (round 10) into the second half of the 2019 Monster Energy AMA Supercross season, Tomac took a small bite out of the points gap between him and championship leader Cooper Webb with an impressive victory on what was a tough and demanding Daytona track. It was his third career Daytona Supercross victory. 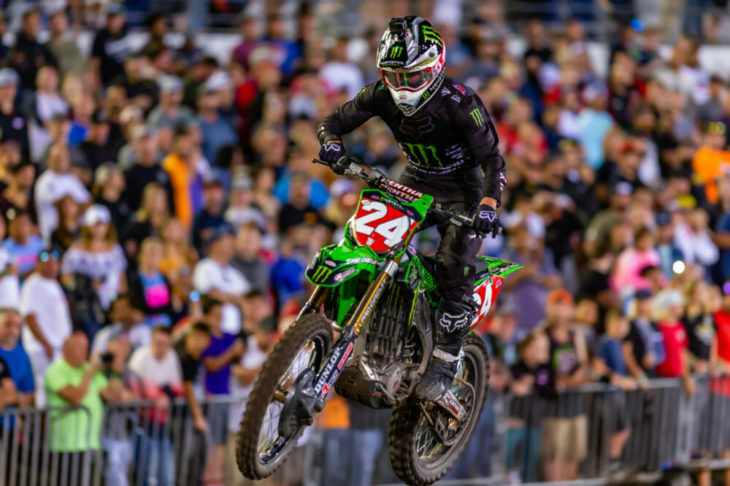 Tomac took the checkered flag 6.889 seconds ahead of Webb and another six seconds ahead of Marvin Musquin after nearly 21 and a half minutes of racing. At first, however, things looked a little iffy for Tomac (Monster Energy Kawasaki) after starting off the race in second behind Blake Baggett (Rocky Mountain ATV/MC-KTM-WPS) and then getting passed by Musquin. Now in third, Tomac regrouped and quickly found his rhythm on the rutted track. He passed Musquin back and then set out after fast starter Baggett. Tomac got around Baggett on the fourth lap and, from there, never looked back, as he slowly inched away from the field to let Baggett, Musquin and Webb squabble over second and third. Musquin held second for a while, but he would end up being his own worst enemy on the night. Mistakes here and there throughout the race while dicing with Baggett and Webb would be his undoing. One of those mistakes came while pressuring his Red Bull KTM teammate, Webb, for second place late in the race. That bobble sealed his third-place finish on the night. Webb successfully resisted Musquin’s attacks throughout much of the race to take second, finishing approximately six seconds ahead of Musquin. Baggett ended up fourth, crossing the finish line two seconds behind Musquin. Joey Savatgy (Monster Energy Kawasaki) was fifth after fighting back a charging Zach Osborne (Rockstar Energy Husqvarna) late in the race. Seventh went to Justin Hill (JGRMX/Yoshimura/Suzuki) who had five seconds on eighth-place Ken Roczen (Honda HRC), who went down in the first turn after tangling with his teammate Cole Seely. Roczen was 19th after the first lap, Seely 21st. 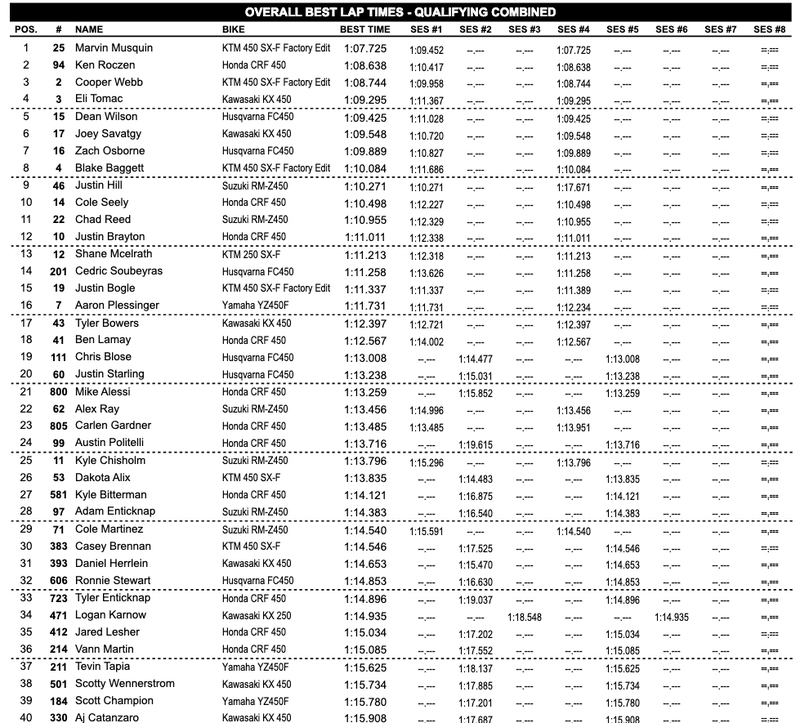 Seely managed to make it back up to 13th. Rounding out the top 10 was Chad Reed (JGRMX/Yoshimura/Suzuki) who started off the race in ninth. 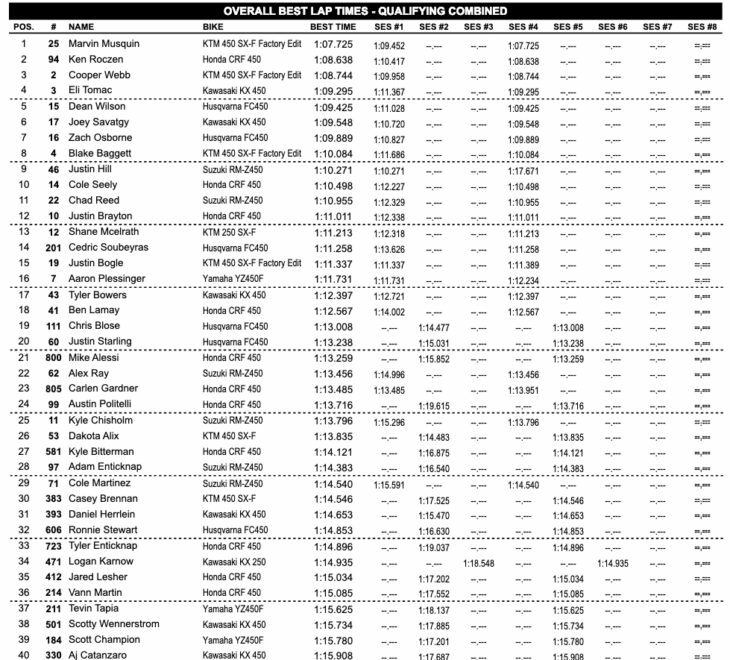 Shane McElrath, on the 250cc TLD/Red Bull KTM, was 12th. 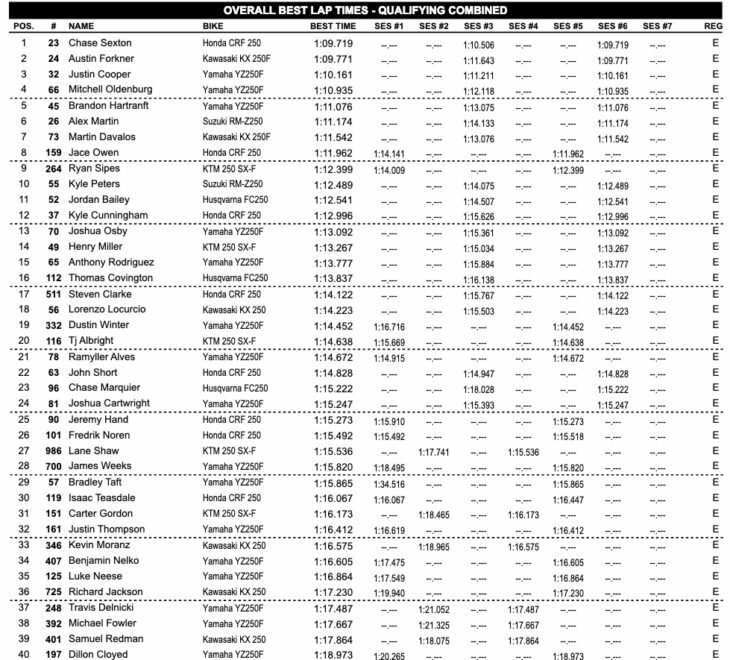 Despite finishing second, Webb’s points lead actually grew to 19 over Tomac and Musquin who are now tied for second. Roczen, who started the night second in the standings 13 points behind Webb, is now fourth in the championship, 21 points in back of the leader. The Monster Energy Yamaha Team suffered another blow when it’s lone 450SX rider crash in a rhythm section and was ejected off the bike. He land on his feet but suffered a broken heel. It’s not yet known the severity of the injury nor how long he might be out of action. 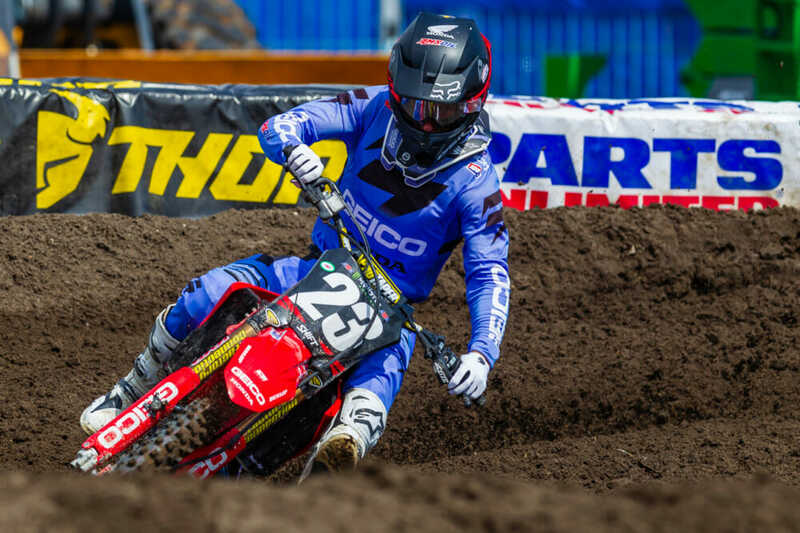 The team’s other rider, Justin Barcia, did not suit up for Daytona, as he is still recouperating from a concussion suffer prior to last week’s Atlanta Supercross. In the 250SX East class, Austin Forkner (Monster Energy/Pro Circuit/Kawasaki) returned to his winning ways. He got around early leader Kyle Peters (JGRMX/Yoshimura/Suzuki) on the third lap and then ran off with the win, crossing the finish line 5.9 seconds ahead of Chase Sexton (Geico Honda). Sexton started the race off in fourth, got around Justin Cooper (Monster Energy/Star Yamaha Racing), then Peters, but couldn’t chase down the leader, Forkner. He did, however, keep Forkner on his toes throughout the 14-lap race. Cooper finished out the race well behind Sexton in third, followed by Mitch Oldenburg (Monster Energy/Star Yamaha Racing), who was other 13 seconds back. Alex Martin (JGRMX/Yoshimura/Suzuki Factory Racing) was fifth, followed by Brandon Hartranft (Cycle Trader/Rock River/Yamaha), Peters, Josh Osby (CTR Motorsports/Yamaha), Kyle Cunningham (HRT/Merge Racing/Honda) and Martin Davalos (Monster Energy/Pro Circuit/Kawasaki). Forkner now enjoys a comfortable 23-point lead in the championship over Cooper and Sexton who are tied for second. Martin is the next rider back, 24 points behind Sexton. 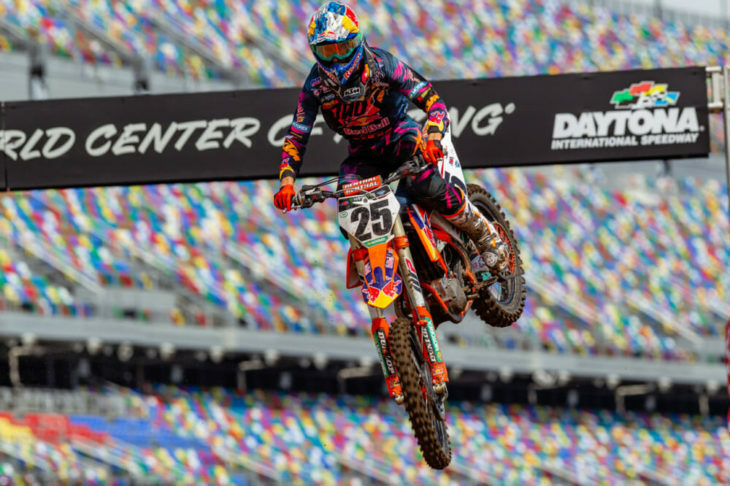 Qualifying is completed for tonight’s Daytona Supercross and both Marvin Musquin and Chase Sexton apprear to be on a mission to nab their first wins of the season. Musquin is flat out hauling on his Red Bull KTM in the 450SX class. Last year he nearly won the race. He was heading in that direction before he fell while leading, handing the lead to Justin Brayton, who went on to win the race. 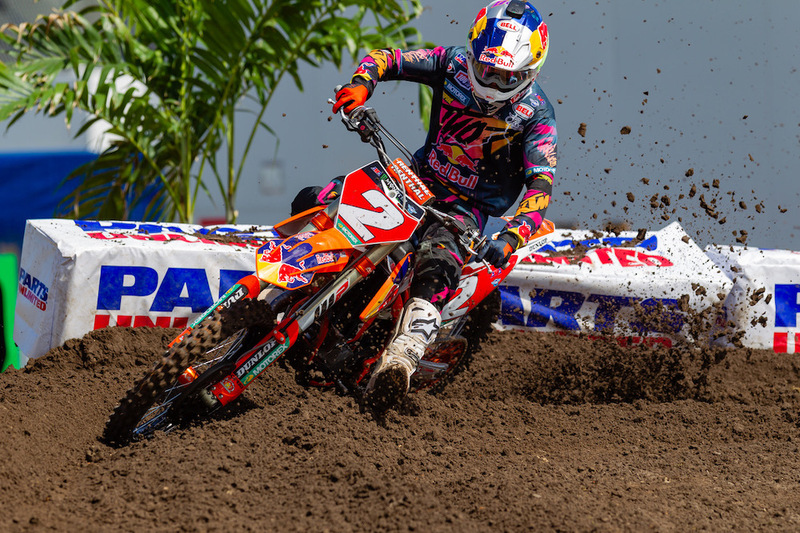 Today, Musquin’s quickest lap was nearly a second faster than the next-best rider, Honda HRC’s Ken Roczen, who is also hungry for his first win of the season and his first since 2017. Points leader Cooper Webb (Red Bull KTM) is right there knocking on Roczen’s back door in third. Eli Tomac (Monster Energy Kawasaki) and Dean Wilson (Rockstar Energy Husqvarna) round out the top five. Shan McElrath, who is holding down the fort for the injury-deprived TLD/KTM/Red Bull Team, qualified 13th in the 450SX class aboard his his 250F. The team’s East riders, Mitchell Falk and Jordon Smith, are both sidelined with injuries, so 250SX West rider McElrath is filling in. McElrath had no time to prepare on a 450, so he’s sticking with the 250F that he is more familiar with. Monster Energy Yamaha’s Justin Barcia did not suit up, as he is still recovering from a concussion. In the 250SX East class, Chase Sexton (Geico Honda) edged out Austin Forkner (Pro Circuit/Monster Energy Kawasaki) for top honors. Sexton’s best time was a 1:09.719 and Forkner’s was a 1:09.771. Justin Cooper, Mitchell Oldenburg and Brandon Hartranft complete the top five. Ryan Sipes (KTM) qualified ninth. It’s been said by some of the supercross riders in the past that the Daytona Supercross marks when the real racing for the championship begins. 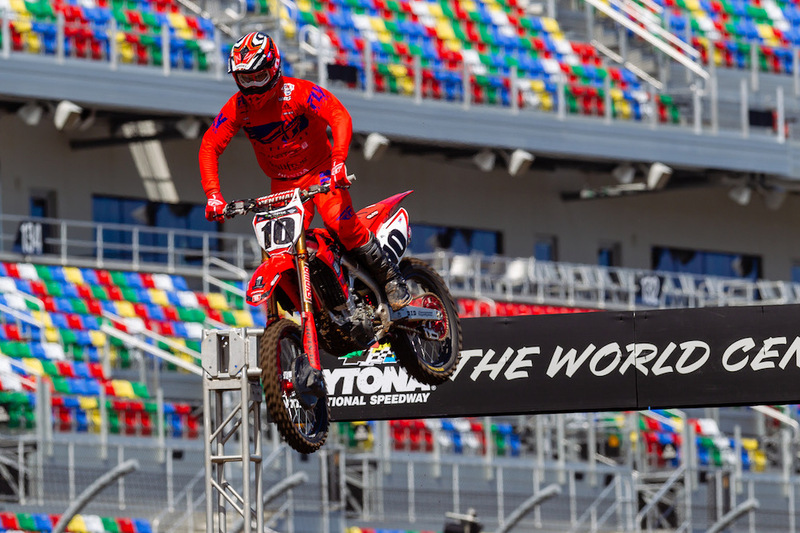 If that is true, then things should really start heating up tomorrow when round 10 of the 17-round Monster Energy AMA Supercross Series rolls onto the infield of Daytona International Speedway in Daytona Beach, Florida, March 9. Today, Friday, March 8, some of the riders got a chance to take a few laps on the Ricky Carmichael-designed track during Daytona Supercross media day 2019. One of the riders on hand today was last year’s surprise winner Justin Brayton of the Smartop/Bullfrog Spas/Honda Team. He won the race just four days before his 34th birthday making him the oldest rider to ever win the prestigious race. He’s back to defend his Daytona victory. Chad Reed, winner at Daytona in 2004, 2005 and 2009, is also on the entry list and hopes to break Brayton’s record at the age of 36. Reed has other history to think about, as well. 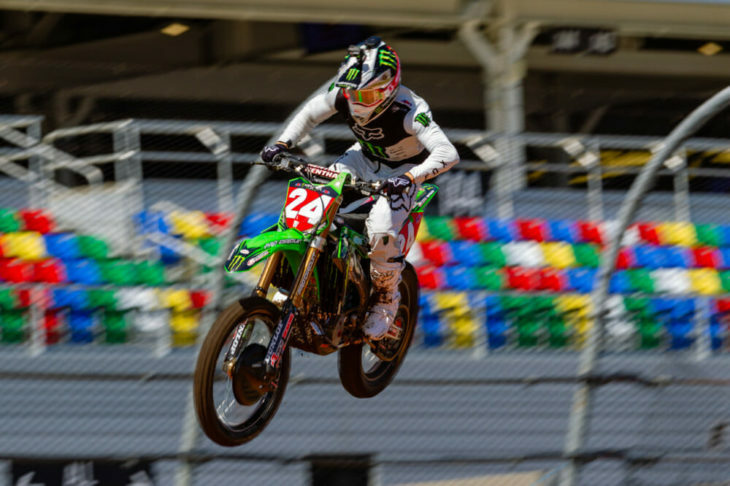 A victory Saturday would make him the third four-time Daytona Supercross Champion, joining Jeff Stanton and Ryan Villopoto on that short list. Reed is currently one of four three-time champions alongside Bob “Hurricane” Hannah, Mike Kiedrowski and Jeremy McGrath. But the rider who is undoubtedly the favorite to win is one of the young guns, points leader Cooper Webb (Red Bull KTM). Webb has won five of the nine rounds held so far and finished third at Daytona last year. Word has it that Justin Barcia will again sit out Daytona as he recovers from a concussion suffered prior to last week’s Atlanta Supercross. Ryan Sipes will be racing tomorrow. The motocrosser-turned-a-little-bit-of-everything racer is adding supercross to his repertoire this year. “It’s been six years since I’ve raced supercross, or even been on a track,” said Sipes who will compete in three disaplines–supercross, GNCC and TT–this coming week. “I’ve basically lived at the supercross track the past month,” he said of his preparation. “I’ve been getting used to that because supercross is one that you can’t just show up and fake it. You have to be ready and prepared. So I’ve been doing that, still riding some off-road and a little bit of flat track. I’ve got supercross tomorrow night, GNCC Sunday and then flat track on Thursday. It’s going to be a busy week, but I’m looking forward to it. Sipes will compete in the 250SX East class. In the 250SX East division, Austin Forkner hopes to get back to his winning ways after seeing his perfect season turn not-so-perfect last week. Forkner was shaken up by a couple of crashes in practice in Atlanta and toned it down a couple of notches in the main event, where he finished third. Justin Cooper is hungry for a win. In fact, he’s staving for a win in order to close the 18-point deficit between him and points leader Forkner. The Troy Lee Designs/Red Bull KTM Team will be without the services of 250SX East racers Jordon Smith and Mitchell Falk due to injuries. However, 250SX West team rider Shane McElrath will represent the squad in the 450SX class–on a 250F! McElrath is currently third in the 250SX West Championship. The team has been hit hard with injuries lately. Last week during media day for the East-West Showdown, Sean Cantrell suffered a broken wrist.